So I admit, I love routine and when it comes to my breakfast it hardly ever varies. Some might think this is boring and couldn't imagine eating the same thing day after day. Not me. I actually forward to it. My go-to breakfast is: Peanut Butter Banana and Flax Toast. Dense, sprouted, whole grain bread toasted to golden perfection. The warmth from the bread heating the peanut butter into ooey-gooey creamy goodness. Thin banana slices layer the top providing a sweetness that pairs perfectly with the slight saltiness of the peanut butter. The toast wouldn't be complete without the finishing touches of ground flax seeds and cinnamon. Now that's toast perfection! I round my toast off with plain Greek yogurt, topped with the extra banana slices, some more ground flax and cinnamon, along with a hard boiled egg. But the great thing about this toast is it doesn't have to be eaten for breakfast! The carbohydrate and protein combo makes a great pre- or post-work out snack. Give it a try! Toast the bread in the toaster until golden brown. 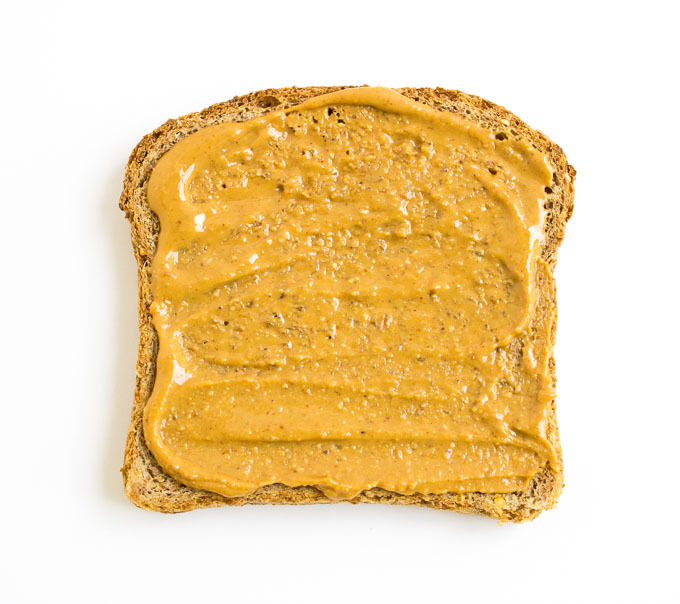 Spread the peanut butter on the toast, so all the corners are covered. Slice the bananas into thin slices and place them side-by-side on the toast. Sprinkle with flaxseed and cinnamon.